The Queen's Visit to the Britannia Tubular Bridge. Source: Life and Times, 521. 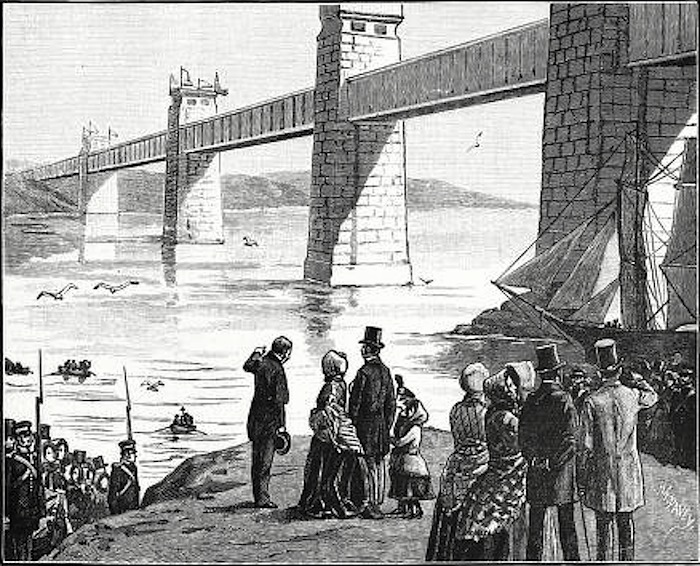 This happy holiday [in Balmoral] was sadly broken by the death of the Duke of Wellington, which brought the Court unexpectedly back to Windsor in October , their route being through Edinburgh, Preston, Chester, and North Wales, where they inspected, on the 14th of October, the Britannia tubular bridge over the Menai Straits. The Queen drove through the bridge in a State carriage drawn by men, while Prince Albert, accompanied by Mr. R. Stephenson, walked across on the roof of the tube. On reaching the south end, the party descended to the water's edge, from which they obtained a complete view of the magnificent proportions of the gigantic structure (Life and Times, 523). The Life and Times of Queen Victoria, with which is incorporated "The domestic life of the Queen," by Margaret Oliphant. London: Cassell, 1902. Internet Archive. Contributed by Cornell University Library. Web. 6 October 2017.